Before I get too far ahead of myself , have a look at this card. What I really enjoy about this one is that each of these guys could hit the ball out of the ballpark with relative ease. Yet, each of them had such a different physical look. 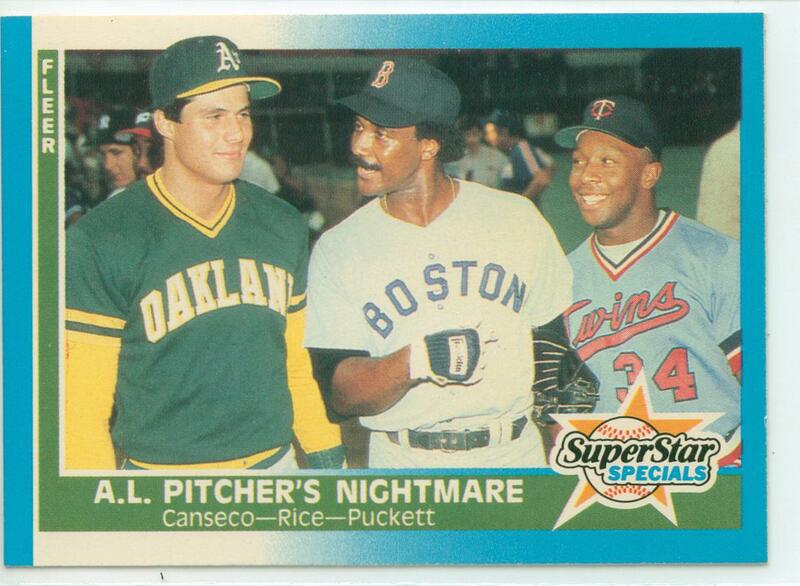 Canseco was the muscle-bound slugger with the quick wrists. Rice was the long hitter with the effortless swing. Puckett was the short and stocky player that could drive the ball for miles with his hefty swing. AL Pitchers Nightmare? I THINK SO!!! This entry was posted in Kirby Puckett Collection and tagged 1986 world series, 1987 world series, 1991 world series, 40/40, 40/40 club, a's athletics, all-star, baseball, baseball cards, bash brothers, boston red sox, collecting, collection, gold glove, Hall Of Fame, hobby, HOF, home run king, jim rice, jose canseco, Kirby Puckett, minnesota twins, most valuable player, MVP, oakland A's, Oakland Athletics, ozzie canseco, red sox, rookie, Rookie of the Year, ROY, silver slugger, stolen bases, topps, twins, world series. Bookmark the permalink. Is that Harold Baines and Dave Righetti behind Caseco?